Click + to show the history of that decade. Click - to hide it. 1940s-1950s - Utah Occupational Therapy Association (UOTA) discussion to begin an occupational therapy program in the state of Utah. The idea was revisited with communications between the UOTA and the University of Utah periodically throughout the next 40-50 years. 1948 - the Utah Society for Crippled Children and Adults hired Mrs. Ruth Brown as the first registered Occupational Therapist. 1949 - Dr. Branch of the Salt Lake County Hospital for the Mentally Ill felt OT was a vital part of any psychiatric program and through his efforts and planning, early OT work began. He gave his full support for the development of an Occupational Therapy program of education. 1952 - Miss Dorothy Ericson was the first OTR on record at the Utah State Hospital. 1952 - In 1952 OTs in Utah banned together to establish a state OT association. 1954 (Oct.) – The Association was established October, 1954 with Frank Jackson as 1st President with 15 charter members. 1954 - Utah was formally admitted to the National OT Assoc on 17th October. 1954 - Provo State Hospital Expanded and a rehab program was established. 1956 - Betty Pflueger became the first Rehab Therapist in the U of U Medical Center. 1957 - The VA program was expanded to include neuro, psych, geri, TB. 1958 - In 1958, “An Appraisal of the needs for an Occupational Therapy School in Utah” was presented by Blanche Humphreys, as a thesis submitted to the faculty of the University of Utah in partial fulfillment of the requirements for the degree of Master of Science in the Department of Education. 1967 - Diane Mitler is UOTA President. 1970 - Denise Grossbeck-Crimminson is UOTA President with 14 members. 1972 - Miss Virginia Kilburn (Director of Professional Education Services, AOTA) submits a letter to Dr. Jepson (Chair of the division of health sciences, college of health, phys ed & recreation at the UofU) documenting the plans for an OT curricula at the U of U. 1972 - Hilda Smith (OT teacher candidate) receives letter from O.N. Hunter (Dean of College of Health) stating that the OT program would begin September, 1974. 1972 (Dec.) - 18 UOTA Members. 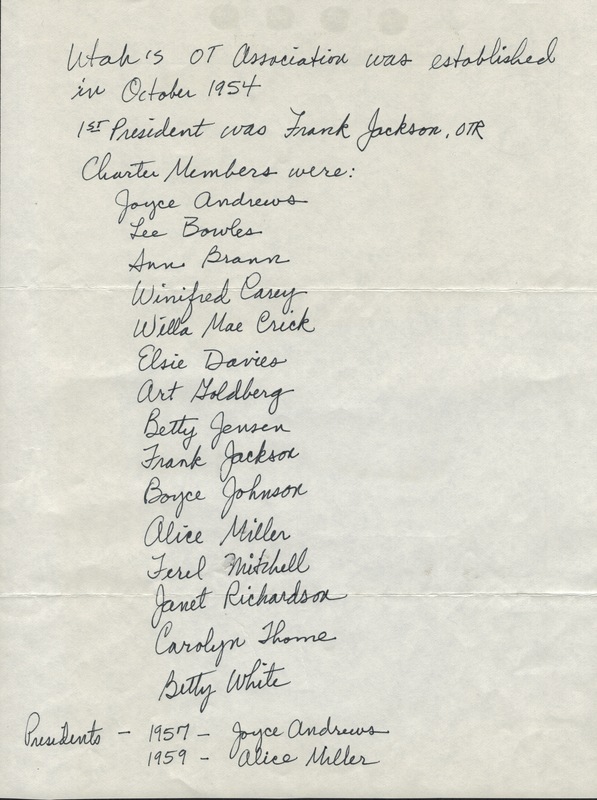 1973 (Dec.) - Pamela Bauman is UOTA President with 24 members. Jan. 18, 1974 - O.N. Hunter sends letters to all OT student candidates stating that funding needed to begin the University of Utah OT program was declined by the legislature, due to loss of fuel related tax revenue. 1974 (Jan 22) - Allied Health Professions Group, chaired by Pamela Bauman documented 16 professional groups represented. 1974 – UOTA admitted to the AOTA. 1974 – Denise Grossbeck - Crimminson Term Ends. 1974 (Dec.) - 30 UOTA Members. 1975 - Linda Summers is UOTA President. 1975 (Dec.) - 39 Members. 1976 (Mar. 9): Licensure Meeting. 1976 (April): Received final membership approval of the proposed licensure bill. 1976 (Apr - Sep): Obtain support letters & tentative Legislature sponsors. 1976 (Nov): Obtain final legislative sponsors after elections. 1976 (Nov 1.) PHOTO: "Stroke Victim 'on Way' After Intense Therapy" (Mentions OT Robin Hough & Deborah Maddox). 1977 (July 13) - Licensure board for OT Practice Act organized. 1978 (April 14): Letter to Stephen Thompson, Legislative Auditor General from Barbara White, Chair of the Licensure Board requesting re-authorization of Practice Act. 1979 - Carla Peites is UOTA President. She works to unify the occupational therapy practitioners from south to north and increase membership attendance at annual meeting and continuing education offerings. 1980s - In the early 1980’s the UOTA began serious formal discussion to bring a school of occupational therapy to Utah. 1981 (September 22) PHOTO: Letter from Susan Scott (AOTA) returning picture with Senator Hatch. 1983 – Carla Peites Teitt Term Ends. 1983 – Leah Mancini Term Begins. Initiated the 4 state conference. Reached out to visit OT’s working in major facilities throughout the state. Committee priorities: Cont Ed, Licensure, Legislation, Newsletter, Public Relations, 3rd party reimbursement, Membership. 1984 - Stephanie Presseller (AOTA director of the division of education) responds to Nancy Inaba (Director of OT Dept. at U of U [Hospital]) giving support for the establishment of an OT education program at the U. 1984 (Sept.) David Compton (Dean) responds to Leah Mancini (UOTA Pres.) gives his support for the advancement of an OT program at the U, but that he was turning over his representation to Dr Kent Allsop, head of the PT division. 1984 (Apr) - 1985 (Feb): First sunset of practice act. 1985 (Jan) - Leah Mancini UOTA president, wrote letter to continue licensure in Utah. Proposed to add education requirement. Licensure board members represent- physical disabilities, mental health, pediatrics, geriatrics. 1985 (Jan 15) - Senate Bill #2 Addresses the issue of continuing state licensure for OT. 1985 (Oct.) 12 years after initial OT program proposal, Leah Mancini writes to Chase Peterson, pres U of U to reaffirm the need for an OT program in the intermountain region and to request adequate funding. 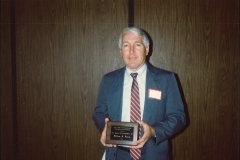 1985 - 62 UOTA members. 1985-1986: In 1985-86, the Board of Regents denied funding for an occupational therapy program at the University of Utah. 1986 (July 12) - PHOTO: "U of U President Might Resign Over Budget Issue" newspaper article. 1986 (July 20) PHOTO: "Utah's Professors Paid Less Than Colleagues" newspaper article. 1986 (Sep) - 86 UOTA members. 1986 (Nov 9.) - PHOTO: "Budget Woes Worry Utah Educators" and "Teachers Fear Higher Education Isn't Making the Grade" newspaper articles. 1987 - PHOTO: Analyst: "Funds are Few for Handicapped" and "Parents of Handicapped Urged to Lobby" newspaper articles. 1987 - PHOTO: Analyst: “Funds are Few for Handicapped” and “Parents of Handicapped Urged to Lobby” Newspaper Articles. 1987 – Leah Mancini Term Ends. 1987 - Eunice Zee Chen President. Articles of Incorporation for UOTA (see 1991 below). Signing of an OT Proclamation by Utah’s Governor for last 3 years. Formation/resurrection of an “OT school committee” to pursue possibilities of a professional OT Program in the state. Completed the establishment of a COTA program at the Salt Lake Community College and served on the Advisory Board. Developed a Recruitment Plan & received $1,400 from the AOTA Committee of State Association Presidents. Organized a joint discipline meeting of OT, PT, speech & RT. Initiated discussion of setting up an AOTF scholarship. 1987-1991: Not being thwarted by the denial, the Presidency of Eunice Chen, 1987-1991 continued to believe a school for occupational therapy in Utah was needed. Eunice formed a standing Education Committee to put forward further efforts for a school of occupational therapy. Leah Mancini and Brenda Lyman were appointed as co-chairs to head this effort. The effort continued with and then moved beyond the University of Utah. Conversations went forward with Weber State University and Westminster College. Dean Compton over the College of Health at the University of Utah suggested that the UOTA participate in writing a grant for initial funding for an OT program, as funding was perceived to be an issue. A grant was co-written by a University of Utah representative, Eunice Chen, and Brenda Lyman. The grant was not funded. There was much resistance at the time coming from the Physical Therapist program at the University of Utah not supporting an Occupational Therapy program. 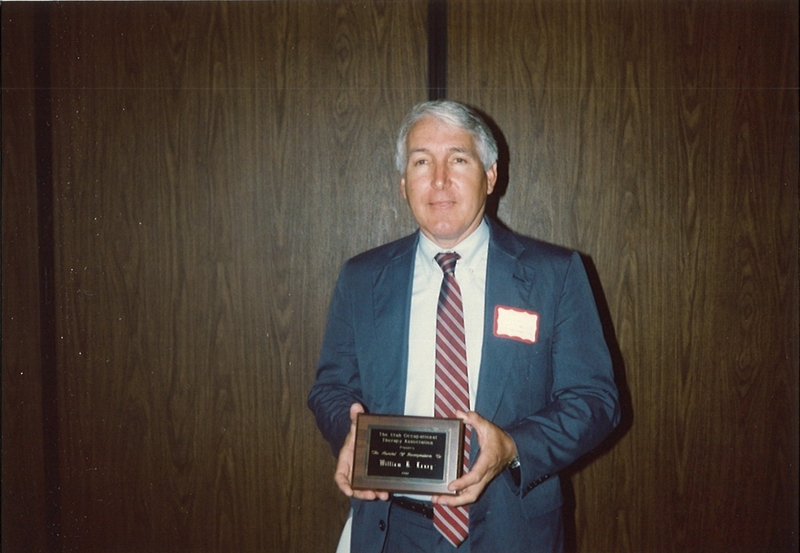 1988 - In 1988, Bill Laney, director of Continuing Education at the Salt Lake Community College (SLCC) reached out to Eunice Chen, President of the Utah Occupational Therapy Association about the possibility of starting an Occupational Therapy Assistant (OTA)program at the SLCC. 1989 - A meeting was scheduled in 1989 between the UOTA and the SLCC. It was decided by both parties to move forward with the first program for occupational therapy in the intermountain region—Utah, Idaho, Wyoming, and Nevada—to be in the state of Utah—an Occupational Therapy Assistant program at the Salt Lake Community College. 1989 - Several members of the UOTA were invited to a meeting in 1989 between the SLCC and the UOTA with the hopes to develop an OTA program. Brenda K. Lyman was asked at that meeting by both the UOTA and SLCC to work as an independent contractor devoting 10 hours/week to determine the steps in program development. Brenda was also asked teach a course on Medical Terminology as an adjunct to get better acquainted with education. 1989 - Through 1989, Brenda Lyman and Bill Laney worked hard writing a proposal to submit to the Utah Board of Regents requesting OTA program status for the Salt Lake Community College. 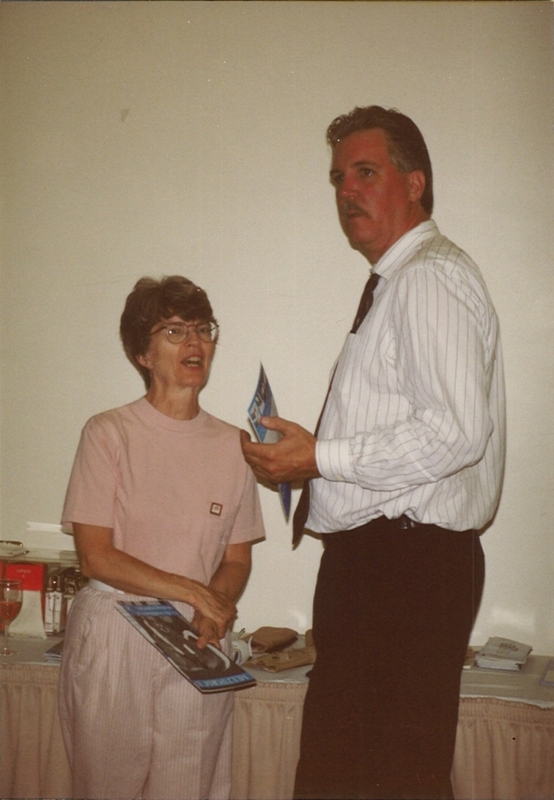 Brenda shared an office with Bill Laney in the Construction Trades Building on the second floor. Invested UOTA volunteers worked with Brenda to develop curriculum for the program. Meetings were held at night or on weekends—when clinicians were off work. Brenda’s 10 hour/week turned into 20+ hours/week. 1990 - Administrators at the UofU College of health continue to communicate with the AOTA, expressing interest in offering a B.S. degree in occupational therapy. These communications were fueled by the UOTA. 1990s - Occupational therapy advocacy committee was formed to promote and support the development of the U of U’s request to fund an OT program. 1990 - Membership Dues = $20.00 for COTA’s & OTR’s. 1990 (Jul) - 90 UOTA Members. 1991 - By 1991, the Utah Board of Regents approved OTA program status for the Salt Lake Community College. 1991 - In 1991, American Occupational Therapy Association, the accrediting body at the time, granted developing OTA program status for the Salt Lake Community. 1991 - The OTA program was given office space to share with the new Physical Therapy Assistant (PTA) program. The shared office space was in a back room of a red single-wide trailer parked in the LifeTime Activity Center parking lot. Brenda shared this office space with Diana Ploeger, (whom Brenda had recruited to develop a SLCC PTA program),from Primary Children’s Medical Center where they still both worked as part-time clinicians. 1991 - In 1991, the OTA program was given lecture and lab room space off-campus in a small brick home of about 600 square feet called the “Rock House”. The family who had sold it to the SLCC had the last name of “Rock”. Although the sewer had a tendency to back up in the basement, we were grateful for space. 1991 - In 1991, the word got out that the program was “a go” and by 1992, the OTA program had over 60 applicants. 1991 (April 10) - Under Eunice Chen’s presidency, Articles of Incorporation for the Utah Occupational Therapy Association as a non profit was completed. 1991 – Eunice Chen Term Ends. 1991 – Paulette Welch Term Begins. 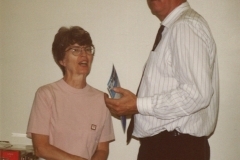 1991 – Brenda Lyman receives a UOTA Award. 1991 - PHOTO: "SLCC Receives Support for Occupational Therapy Program" newspaper article. Mentions Eunice Chen. 1992 (Nov. 6) - The Salt Lake Community College COTA program was approved by the Board of Regents. 1992 - In 1992, the first class of OTA students were screened and interviewed with 24 being selected for the first class. 1993 - In 1993, Brenda was officially hired full-time by the SLCC as the program coordinator and sole full-time faculty member. Courses were taught by her and 13 adjunct faculty who were OT clinicians. 1993 - The Salt Lake Community College courses were offered in quarters (changing to semesters years later). Brenda knew Fred Sammons, invited him to Utah in 1993, and he donated $1000 to help start the program. 1993 (January 4) - PHOTO: Letter from Denise Keenan to Eunice Chen requesting to setup continuing ed with the UOTA teaching the role delineation between OTs and COTAs. This happened the year before the first SLCC OTA graduation in 1994. 1993 (Mar. 16) - Nancy Johns was the Licensure Task Force chair, Craig Moody contracted as lobbyist. 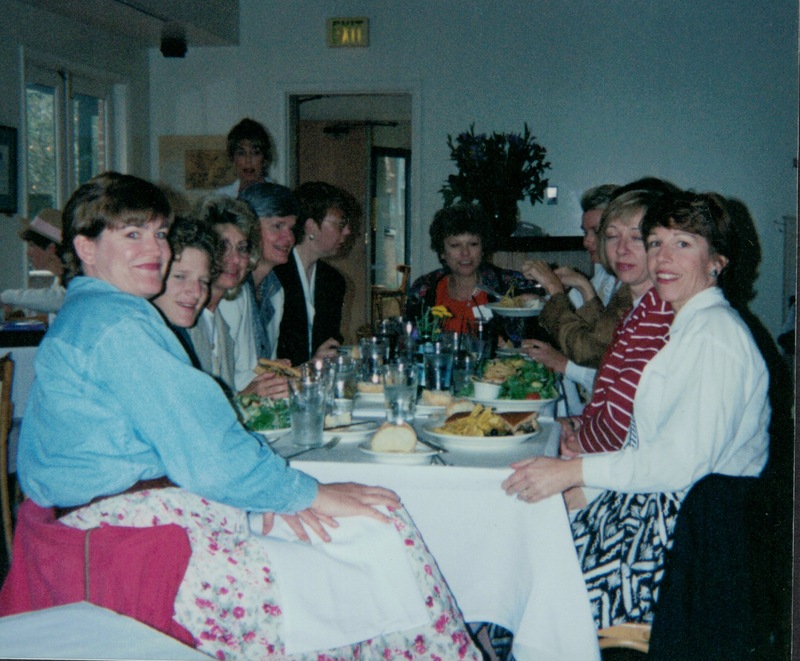 1994 - SLCC OTA program celebrated its first class of 23 graduates. 1994 - The SLCC OTA program was awarded AOTA program accreditation in 1994. A SLCC OTA program advisory committee (PAC) was initiated in 1994 and has been active to date. The OTA PAC has continued to support OTA education for over 24 years and was instrumental in the early 2000’s to keep the program viable when low enrollment numbers threatened closure. Eunice Chen has been a member of PAC since inception and continues to be an active member today. Brenda resigned as faculty/program coordinator at the end of the summer in 1994, soon after having her third baby in four years. Leah Mancini stepped in as interim for the spring quarter during Brenda’s maternity leave. 1994 - Anne England was recruited from Washington State to replace Brenda as full-time faculty/program coordinator fall of 1994. 1994 - Governor Mike Leavitt Signing OT Month Proclamation. 1994-Present: There has been over a 95% pass rate with the National Board for the Certification of Occupational Therapy (NBCOT) on average since the inception of the program in 1994 to present. 1995 (January) - In January of 1995, Administrators within the College of Health participated in discussions with others, including personnel from Weber State University, regarding the option of Salt Lake Community College University Center offering an Occupational Therapy Program through Colorado State University. While this option was deemed less desirable than offering such a program at the U, it would allow for residents of Utah to access an accredited B.S. program. 1995 - Occupational Therapy Practice Act sunset adopted. 1995 – Paulette Welch Term Ends. 1995 AOTA president Mary Evert visits Utah and speaks to the UOTA. 1995 - Initiated computer operations for the organization including a membership directory, & membership billing. 1995 - With executive board approval, an office manager to assist with operations was contracted. 1995 - Sent letter of intent to pursue an AOTF scholarship. 1995 - Member Rate $30 OTR/L $25. COTA Students $20. 1995 - Performed extensive written correspondence annually with members of the state legislature, community agency representatives, AOTA and UOTA leaders. 1995 (Oct) - The University of Utah was notified that Weber State University and Salt Lake Community College were proposing a Bachelor of Science Degree program in Occupational Therapy. Nov. 20, 1995 - The U submitted a response to the request on November 20, 1995. 1996 (Apr.) - $3,000 received from AOTA Committee of State Association Presidents. 1996 - (Jun 18) - $10,000: Gift to SLCC OTA program $ 4,000. Conducted regional Meetings- St George, Logan, Ogden. 1996 (Aug) - 143 UOTA Members. 1997 - 1998 - 135 UOTA Members. 1997 - OT Advocacy Committee Reorganized and name changed to the Program Advisory Committee. This committee consisted primarily of UOTA members such as Denise Keenan, Eunice Chen, Heidi Hanley, Leah Mancini and others. 1997 (Aug) - Dr. JoAnne Wright (PhD.) was hired to develop the U of U OT program in accordance with the American Occupational Therapy Standards, advise interested students in program status/prerequisites, act as liaison to the COTA program at SLCC, and act as liaison to the UOTA. 1997 (Sep. 8) - Formal letter of intent was submitted to the director of the American Occupational Therapy Association accreditation department (Accreditation Council for Occupational Therapy Education, or ACOTE). 1997 (Oct. 22) - ACOTE responded, acknowledging receipt of the letter and outlining tentative target dates for the accreditation process. With strong endorsement from Dr. John M. Matson (Health Sciences Sr. Vice President) University of Utah included funding for an occupational therapy program in its budget request to the Regents. At a meeting held in the Regent’s Office to resolve the issue of program site the University of Utah, College of Health under the direction of Dr. John M. Dunn, as Dean, was asked to take the lead in developing and promoting an occupational therapy program for the State of Utah. 1998 (Jan) - The University of Utah and the Board of Regents officially approved the occupational therapy program as a top funding priority to be submitted to the 1998 Utah State Legislature. The community, including the Utah Occupational Therapy Association (UOTA), the Coalition for People with Disabilities, consumers and their families, representatives from health care, prospective OT students, higher education officials, and representative of state government provided strong support for the implementation of this program. National leaders from the American Occupational Therapy Association and the American Occupational Therapy Foundation also offered strong support for a program in the State of Utah. 1998 (Jan 19) - The 1998 legislature convened on January 19. The University of Utah presented to the Higher Education Appropriations Joint Subcommittee, David Steele and Afton Bradshaw, Chairs. February 18, 1998 funding was approved for the Occupational Therapy program. The amount to be added to the $50,000 appropriated the previous year was $174,500. 1998 (Jan 26) - Two introductory courses: Occupational Therapy 300 (OC TH 300) Introduction to Occupational Therapy (Quarter course) and Occupational Therapy 3000 (OC TH 3000 Introduction to Occupational Therapy (Semester Course) were approved by the College Curriculum Committee. The 300 course was taught once and was replaced by the 3000 class, which continues to be taught but is neither part of the prerequisites nor part of the actual master’s program leading to a degree in occupational therapy. 1998 - The legislature approved University of Utah OT program. 1998 - Initiated trialiance of OT, PT, Speech presidents to advocate on common issues of practice and legislation. 1998 - Cathy Szumigala sets up first UOTA webpage. 1998 - AOTA acknowledges OT program at the U of U in developing status. 1998 -1999 - 139 Members. The Senior Vice President for Health Sciences (Dr. John M. Matsen), the University President (President Bernie Machen), the Academic Senate, the Graduate School, the Board of Trustees and the Board of Regents granted approval for the Division of Occupational Therapy. This action included: 1) the Request to start a Master’s Entry-Level Occupational Therapy program; 2) recognition of the Bachelor’s Degree in Occupational Therapy Studies for students applying without a BS/BA. Intermountain Health Care (IHC) pledged substantial amount of money for start-up equipment. 1990s (Late): In the late 1990’s Anne England left the SLCC. Eunice contacted Leah Mancini again, and pulled her from retirement to take the faculty/program coordinator position. Elaine Holt also left retirement to serve as a second faculty. Leah and Elaine saved the program as it was very difficult to find qualified faculty to teach in OTA programs at the time. 1999 – Heidi Hanley Term Ends. 1999 – Lorraine Moe Term Begins. 1999 (July) - The Program Developer became the Division Chair (July 1999), the Administrative Assistant (Laurie Ketsdever) was hired in December of 1998 and the Clinical Education Coordinator (Yda J Smith, MOT, OTR/L) was hired in March 1999. The Division received its first scholarship from G. Mitchell and Betty Morris. In the spring of 1999, the inaugural class of 17 students was admitted to the University of Utah to begin their studies that fall. In June of 1999, the Program Advisory Committee became a more autonomous body with Denise Keenan as Chair of this committee. Late 1990s - Early 2000s - Throughout the late 1990’s and early 2000’s there were several full-time and adjunct faculty filling a variety of positions. Brenda Lyman was asked by the Dean of Health to return to the College in 2002 as an adjunct and then asked to resume a full-time faculty position in 2003. 2000-2001 - 72 UOTA Members. 2001 – Lorrain Moe Resigns. 2001 (Jun) – Bonnie Held (acting president) term begin with 145 UOTA Members. 2002 – State Affiliate Agreements Signed. 2002 (Jul) - Elected 2 year term begins for Bonnie Held. 2003 - Brenda Lyman asked to resume full time responsibilities at SLCC. 2003 - The OTA program was moved to the Applied Technology building where Heating/Air Conditioning had been housed in the early 2000’s. It was one big room, high ceilings,with an overhead garage door. 2003 - SLCC OTA program was designated as the first civically engaged department at the SLCC with over 70% of the courses designated as service learning thus enabling all students to graduate as civically engaged scholars. 2003 (Mar. 13) - Licensure Board voted to eliminate temporary licenses. 2003 – Bonnie Held term ends. 2003 (Nov 4) - Regarding a national trend to dissolve licensure boards, Kathy Bruner UOTA president, speaks in support of continuing with the Utah OT licensure board to protect the public’s health safety & welfare. 2003-2004 - 123 UOTA members. 2005 (Jul) - Member dues increased from $30 To $50 for OTR/L, from $25 to $35 for COTA, and Student dues were $20. Increased use of computer based UOTA information eg membership. Increased frequency of Continuing Education. 2005 (Nov.) – Kathy Bruner resigns. 2006 - Heather Welch, president. 2007 – Heather Welch term ends. 2008 (Jul) - Judy Hall elected president. 2008 - All Health Sciences programs at the Salt Lake Community College moved into a “state of the art” multi-million dollar facility with beautiful dedicated lab and lecture room space for the OTA program. The OTA program also boasts of having a cadaver lab, swimming pool for aquatics therapy, and a computer room. The OTA and PTA program share a waiting room area designed for clients who come to the OTA and PTA Pro-Bono Outpatient Clinics. 2009 (Jan) - Judy Hall resigns as president. Focus was on moving the people who were interested in the UOTA to get the association back on track and worked on outreach to OT’s in the state to increase the feeling of community and improve the community perception of the UOTA. Created regional representatives and special interest section leaders. The vision for the regional reps is that they serve as communication liaisons between their constituents and the association. The special interest section reps are intended to facilitate just that, information and programs to support individual practice areas. Testified in hearings at the Utah State Capitol defending OT scope of practice from infringement as PT and RT were updating their practice acts. Heavily involved, with Kasey Mitchell, in advocating for medicaid expansion, and expanded benefits for persons in the exchange. 2009 (Oct) - Bonnie Held (previous UOTA President) dies of cancer. Service Award was named in her honor. 2012-2013 - 98 UOTA Members. Legislation: Updating and passing of a new Practice Act. Kasey Mitchell & Trent Brown led the legislation committee and the practice act was updated to include continuing education requirements and updated OTA supervision guidelines. Website update to make interactive, including facebook. Continuing Ed offerings increased in diversity of topics & locations. Reflection: It was inspiring to work with a dedicated group of people that care about the profession and the practitioners within, wanting to be current, relevant and connected, both in Utah and in the nation. UOTA Hill day - Appointment of OT to state commission of fall prevention and recruitment of legislators to champion cause of OT’s being reimbursed for telehealth services, reorganization of policies and role descriptions for more effective transition planning. Formalized accreditation process for continuing education courses.